Four New Zealanders have died in Antarctica as a result of accidents while working for the New Zealand Antarctic Research Programmes. I took the photo above a few days after my good friend Jeremy Sykes was killed in 1969, and I have always looked upon this photo as Jeremy's memorial. I call it 'Antarctic Ice. Those 13 months I spent in Antarctica so many years ago, seem but a distant memory. But from time to time I remember Jeremy Sykes and Garth Varcoe, people I could count as friends. I also think of those other two New Zealanders who died in Antarctica, Tom Couzens and Terry Newport, both men with interesting lives that were cut short. The deaths of these four people have been acknowledged to some extent, but Jeremy Sykes and Tom Couzens have received scant coverage. This article sets about to give four brave men, appropriate recognition. Plaque to New Zealanders killed in Antarctica: Lieutenant Tom Couzens (19/11/59); Jeremy Sykes (19/11/69); Terry Newport and Garth Varcoe (13/10/92). It lies beneath the flagpole at Scott Base. Bernie Gunn describes the day Tom Couzens arrived in Antarctica.
" Robb and I went out to the airstrip to pick up our replacement Cat‑driver, Lt. Tom Couzens, straight out of a Centurian tank in the Korean war. It was a whiteout and there was no sign of the C140 Hercules. I went into the Ops hut. "Where the hell is the plane, has she turned back?" "Naw, she's on the ground, taxiin' in by radar!" Then I could hear the motors and as I stared, out of the murk, four propellers appeared, like the Cheshire cat's grin. Presumably behind them was the rest of the 'plane! . 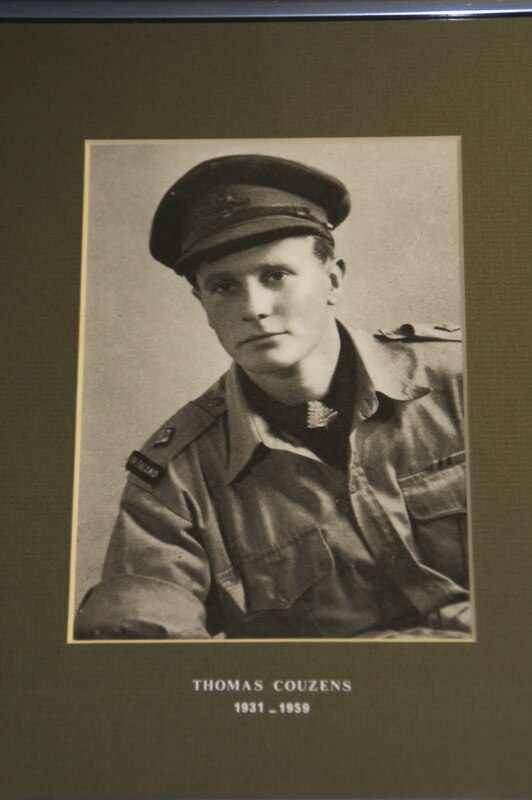 "We went out to meet the plane there were not many passengers and we soon picked a tall, erect young man who could only be an Army Officer." "Thought so, bloody marvellous to be here, I've got all my kit, can we go?" By the time we climbed into the Cat both Robb and I knew we had the kind of man we both wanted. We roared off into the drift with visibility a few yards, cracking jokes. The Hut Point road was flagged and marked with signs like, "Pancho Gonzales, he like hot Tamales!" but we soon left it and swung in a wide curve south and east round Cape Armitage. Only milk could be seen ahead but I could see Robb occasionally polishing the left window and could see a dark patch away on our left, the rocks of Cape Armitage. "You know, I don't want to seem a complete fool, but how the devil do you chaps know where you're going?" asked Tom. "Aw, y' know how it is," said Robb, polishing the left door window again. "When y' been here awhile like Bernie 'n' me y' get a sort of built‑in direction finder!" Later: In the morning the Cats refuelled, Tom gunned the big V8 engine of County of Kent and she spun round, snow flying and a track fouled a tow‑bar. "God Almighty!" said Robb to me. "He got carried away, he thinks it's a Centurion! Tom!, Tom, y' bloody fool, that isn't a tank you got there!" "Oh, God!" said Couzens winding down a window, "Sorry, I got carried away! I thought I was back in the old Cent!" Couzens did have some absorbing tales. He swore the Cent was by far the best tank in Korea and once for a bet, shot his way through the Chinese lines, round a mountain and back home via the American lines. The latter were not impressed as he roared over all their communication cables and severed them! The 1959 season got under way with an 80 day expedition setting out with two TAE Snowcats and three nine-dog teams, each pulling 450kg loads and driven by Antarctic veteran Bernie Gunn. Tom Couzens was driving a Snowcat. On 19 Novembver 1959, the party had crossed the Ross Ice Shelf and was near Cape Selborne when the rear vehicle went into a 30 m-deep crevasse. The driver, Lt. Tom Couzens was killed and Gunn and Lowery were seriously injured and badly frostbitten. I almost asked Couzens to let me drive, but reflected that the machine was his responsibility and did not want to put him in the awkward position of having to obey an order that he might do only reluctantly. We laughed and joked in a carefree way and then suddenly appeared to be precipitated into another dimension. We were falling, upside down, iron clanging off walls of ice. I had the slightest impression of seeing the right front drive pontoon shoot up in the air, of a roll to the right and a crunch of snow against the sno-cat body and a long fall. I had time to think, “Must be a crevasse !“ and then, “If we survive this one, we will be lucky !“ and then came a monumental crash. It was about 10 oclock in the morning. I came to, pinned upside down in a cramped fashion in a tiny space between the seats and instrument panel. What had been the Cat roof was flattened to within a foot of so of the seats. My knees were in my face but I was able to wriggle into a more comfortable position. “Now, think sensibly” I thought. “The others will come, sooner or later, don’t get frostbite, try to get out.” My balaclava had come off and my ears were already painful. I could not get a hand up but was able to wriggle it back over my ears, so I still have them. Lucky, that. I kicked at the crumpled door of the Cat, it seemed totally unyielding and in fact was hard against an ice wall and the jolt sent waves of pain up my mashed-up spine. There was a groan and Lowery came to. He was pinned in more tightly than me but Couzens did not move and it later appeared he was killed instantly by the steering wheel. Above my head on the drivers side, light filtered in and ice gleamed a few feet away. After they were rescued, Gunn wanted to bury Tom Couzens. On his website he explains that moment. "Get Tom out and bury him here under a snow mound, got it? He’ll be in good company round here,” I said. “Alright!” he said briefly, and I gather he did, but some bureaucrat over-ruled my order and had Tom’s body flown home in a rubber bag, an utterly gruesome thing to do. So that was the first New Zealander killed in Antarctica, a talented young life cut short. The next to be killed was Jeremy Sykes, almost ten years later. I trained with them on a snow-craft course on Mt. 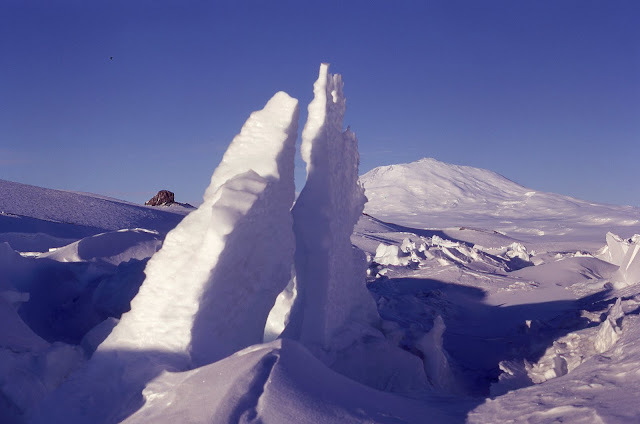 Ruapehu in August 1969 and really got to like them during our week long training at the Waioru Army Camp. In fact I recall walking home with Jeremy, Sam, Kel and Graham from the officer's mess when we spied a tank. "We'll buy the bloodything and take it South" said Graham. Within seconds Graham had pulled a cheque book from his pocket and wrote the words One million dollars, signed it, and rammed it down the tank barrel. 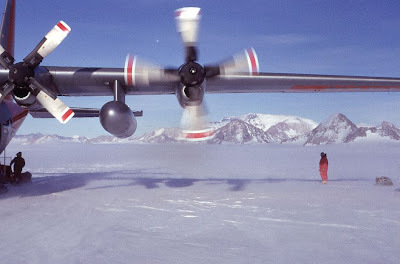 It was the start of a relationship I continued 2 months later when we flew to Antarctica on a Super Constellation, the first flight to Antarctica that season. As I was a mountaineer, I was asked to be a guide for the film crew as they filmed in potentially dangerous places such as in ice caves, crevasses and when they wanted to film in blizzard conditions. On 17 November I accompanied Jeremy, who was Director of the NZ Film Unit team on a trip to drop off a NZARP field party at the Robert Scott glacier, 100 miles from the South Pole. I spoke a lot to Jeremy during and after that trip and got to know this highly intelligent, creative and sensitive man. 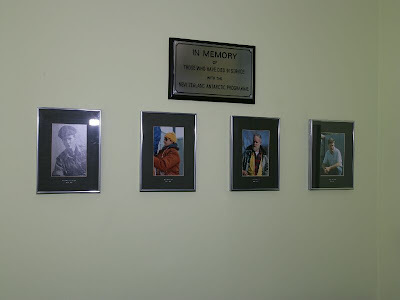 He spoke of his wife, and young boy in Wellington with great love, and I came to admire a man, not your usual rough and tough Kiwi, but an artist with such a positive outlook on life..
Bruce Willis, the winter leader at Scott Base, held a moving memorial service at Scott Base. Twenty three after the second NZ death in Antarctica, on 13 October 1992, New Zealanders Garth Varcoe and Terry Newport were killed in a helicopter crash 40 km from Scott Base. They were returning to McMurdo Station in a US Navy helicopter after rebuilding the hut at a summer research station, Cape Bird. The weather deteriorated during their journey and the helicopter struck an icy slope above a 10 m ice cliff. Varcoe, Newport and Ben Micou, a US Navy helicopter mechanic, were thrown from the helicopter and killed as it slid towards the rocks below. The pilot and co-pilot, also of the US Navy, survived but lay waiting for help, rescue efforts hampered by poor visibility. He rew up in Nelson and attended Waimea College in Richmond. He then attended Nelson Polytechnic where he gained is Trade Certificate in Carpentry (75%) and his Advanced Trade Certificate in Carpentry (70%). Terry also did MOW courses in welding and gas welding. He worked in the building industry in Nelson for 11 years and in this time married Pauline; a marriage he valued very much. They moved to Queensland where he worked for a year and this was followed by a year travelling the world. They returned to Christchurch in 1991 where he found employment in the building industry and at the same time and looking to the future, he commenced studies with the Open Polytechnic for a New Zealand Certificate in Engineering. An outdoor man he enjoyed sea fishing; golf; skiing; off-road motor cycle riding and camping (with some tramping) in the weekends. Terry had high work standards, was conscientious and paid attention to detail in a professional manner. He related to people at all levels, and had a quiet quirky sense of humour. 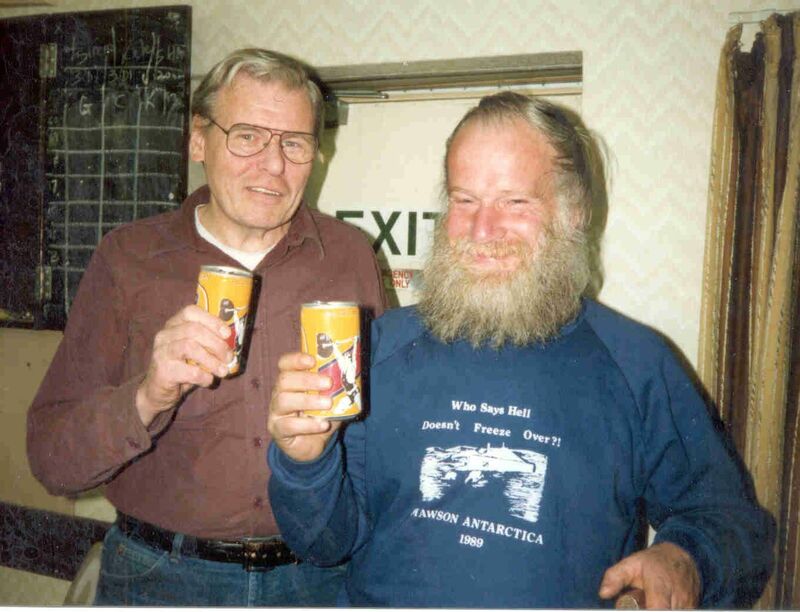 Former Scott Base Manager Dave Geddes (20.10.1992) said Terry who departed for the ice on WINFLY (his first trip south) 24 August 1982, "quickly fitted into life at Scott Base and was sensitive and considerate of his fellows feelings. If ever there was a job to be done, Terry was always the first to volunteer. He was a big man with a big heart. But he was also a gentle and compassionate man who always put others before himself." Newport, a summer carpenter, had only worked in Antarctica since August that year - fulfilling what was reportedly a longstanding ambition. Memorial service for the Mt. Erebus disaster victims at Scott Base on 2 December 1979. 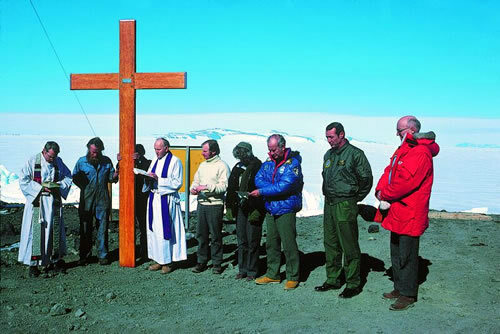 Left to right: US Navy Chaplain, Garth Varcoe, Bob Dunnachie (obscured), Father Creagh, Mike Prebble, unknown, Bob Thomson (superintendent of the Antarctic Division of the Department of Scientific and Industrial Research), Captain Westbrook, unknown. Photo: Nigel Roberts. Garth, his brother Ian and sister Rae, were my neighbours in Dunedin. Garth taught me how to make a crystal set when I was at Life Boys at the Mornington Presbyterian Church, and I did my first major tramping trip with his brother Ian, an Air New Zealand Pilot. 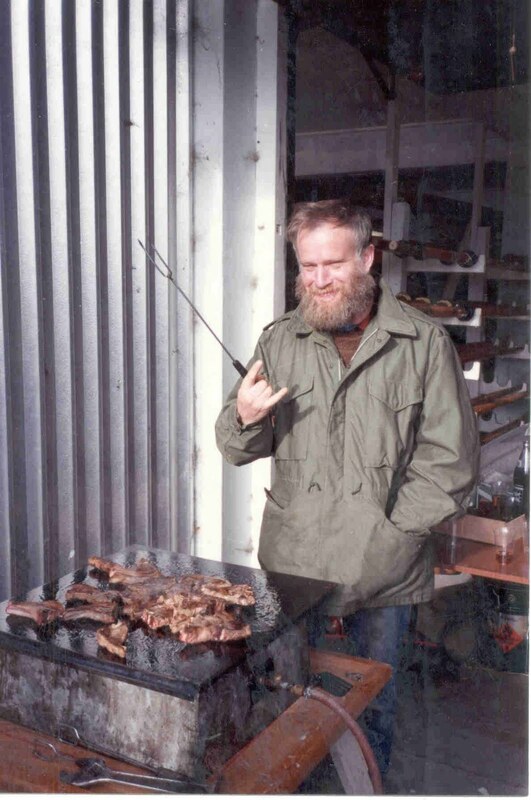 Garth was a very active member of the Otago Tramping and Mountaineering Club and I used to meet him in the hills regularly. I had made at Vanda Station during the winter of 1970. When the station was dismantled, Garth thought of me and brought the sledge back to New Zealand.Garth cared about people and was a man who believed in fair play. When Garth Varcoe was killed, it was his 37th visit. His first was in 1978 as the buildings and services officer of the Antarctic Division of the Department of Scientific and Industrial Research. 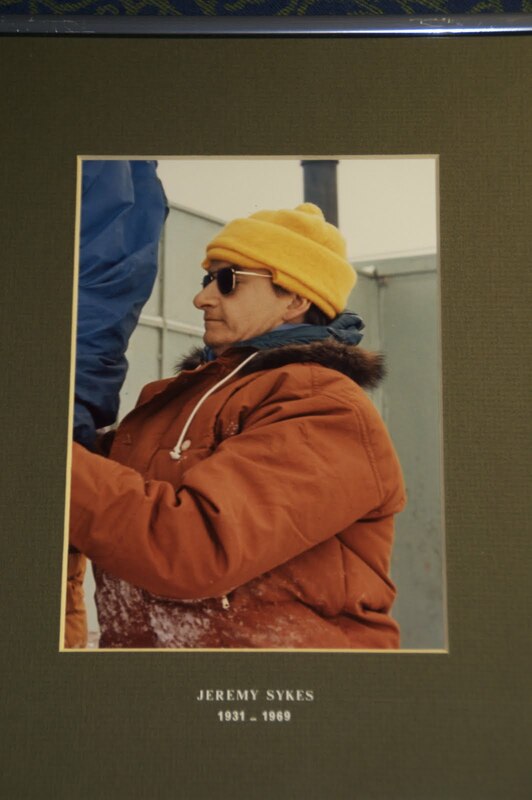 In 1990 Varcoe was awarded the Polar Medal in recognition of his contribution to the New Zealand Antarctic Research Programme. The Wright Valley taken from near the summit of Mt. Newall. The 1969 helicopter crash which killed Jeremy Sykes, is in the lower Wright valley. Garth and his wife Kath, did a lot of work for tramping and mountain communications. In 1989 Garth Varcoe from the DSIR Antarctic Division joined the Canterbury mountain radio service as a base operator and committee member. Garth proved to be a stalwart and made a marvelous contribution to the CMRS until his untimely death, . Kath however, continued on as an operator and member of the committee until 1998. Varcoe Headland is a low [[headland]], 34 m, that marks the north entrance point to [[Horseshoe Bay]] in west [[Ross Island]]. Named by [[New Zealand Geographic Board]] (NZGB) after [[Technical Services Officer Garth Edwin Varcoe]], who worked in the NZ [[Antarctic Programme]] over a period of 15 years until his accidental death in a helicopter crash near this headland in October 1992. His expertise was in the mechanical and electrical areas and he played a leading role in the reconstruction of [[Scott Base]]. Garth Varcoe, building and services officer NZARP at the Midwinter rowing regatta barby at Kerr's Reach 1986. Photo: Gavid Harrowfield. Their names have also been given to geographical features in Antarctica: Varcoe Headland, Newport Bay, Couzens Bay and Couzens Saddle, Sykes Glacier and their photos and name are placed in the foyer of Scott Base.